The partial lockout has kicked in, so we now officially own some players. Discuss your team before we hit the 1:40pm AEDT lockout on Saturday. The partial lockout has kicked in, so we now officially own some players. Discuss your team before we hit the 1:40pm AEDT lockout on Saturday. Whether it is your AFL Fantasy team, your RDT squad or anything else, My Team is where you can post your sides and chat about different players, strategies, etc. If you’re using the DT Live Drawing Board, you can easily copy and paste your team in the comments. If not, please keep it simple. State which comp it is for, how much coin is in the bank and away you go! Be a giver if you want to be a taker! Hit reply on someone else’s comment and give your two cents to keep this community strong. Play Clark over H-church as you can be certain he won’t get the vest. Other than that it’s a solid team. D6 out of Ahmed Saad and Brett Goodes? Who should I have as Mid 5? Scooter or Neale or any other player in the same price bracket? Because we can’t be sure on Anderson playing I’m considering going Anderson to wallis by downgrading mumford to Berger and then I have enough to change dahlhaus to Bartel. Thoughts on the team and changes I suggested? If you see something better let me know. Bartel or Franklin???? Bartel is looking good as always, but I have a feeling about Franklin… someone sway me either way please…..
Franklin averages 5 goals a game against Essendon in his entire career. 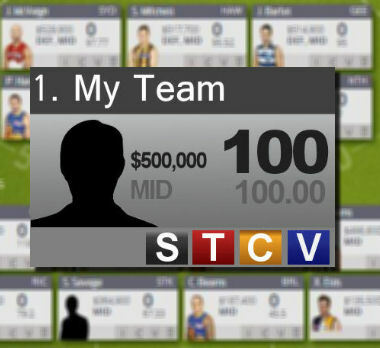 Is it worth using my 64k in the bank to upgrade Sidey/Lewis to Ablett which would leave me with no cash? yes , Ablett is a must… please opinion 2 comments above..
Not having Ablett is like eating bread without butter. Upgrade Sidey. only reason to have Mitchell is if you think he’ll become a defender. Not a fan of having no money left over, I would rather you downgrade him to someone like Griffen just for some cash in case you need it. is heeney really gonna be that good? Rucks are too thin… take out Ebert for Heeney and up grade Leuenberger…not too sure about Lynch, but always go with your gut…. Which 2 of- Pendles Beams and Sidebottom? Have been telling everyone that Bellchambers and Luenberg together are too much of a risk, especially as Luey will be sharing with last years best ruckman…. Which would you prefer? With these two options I’m leaning towards 2.
had worries about putting in Miller (Suns) because of J/S with O’Meara out, but he has done his knee in reserves…maybe all jump on him..
Bennel, Zorko, Dahl or Ziebell? thanks, had him already but I feel like they all could do very well. The fantasy website is a joke i can still switch Newton and Vandenberg. Just saw on the news Sidebottom out for 6 weeks with a broken thumb, nothing was said on Parker though, think he’s OK, might miss a week just to play it safe though, haven’t heard anything on Gablett’s shoulder either, dare say Rockliff will be out for a few weeks with what looks like broken ribs, haven’t heard or seen anything on him though. Rockliff out for 6 weeks, broken ribs, poor bugger. What do these trades sound like. Got $45,000 in the bank if i do these. Giving Kolodjashnij one last chance, if he fails then i will get rid of him. Bartel > motlop / Dahlhaus? Both in form, motlop cheaper and having massive scores. Kolo > thurlow / whitecross? Both super cheap both should rise quite a bit, both have about the same job security but I just feel with how whitecross plays he will go up the ground a little more. I need some answers boys! Thank you. To afford Neale > Fyfe should I downgrade M.Clark to R.Tarrant?